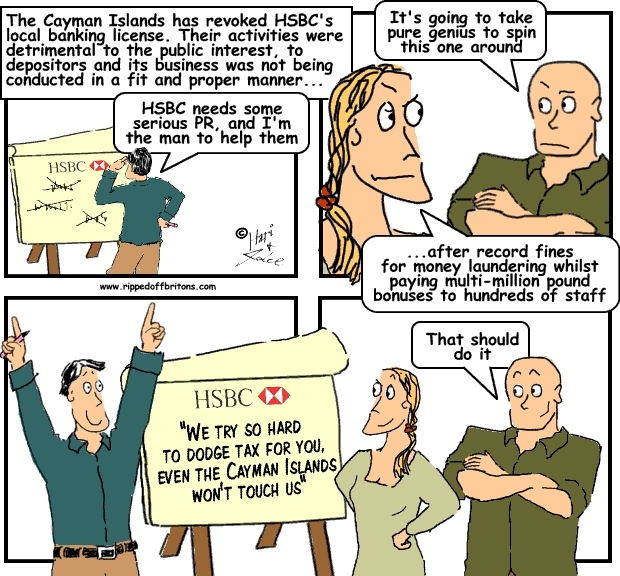 The CIMA concluded that HSBC’s activities were “detrimental to the public interest, the interest of depositors or of the beneficiaries of any trust or other creditors and that the direction and management of its businesses has not been conducted in a fit and proper manner.” Following recent record fines for money laundering whilst paying multi-million pound bonuses to hundreds of its staff, HSBC’s marketing teams are already at full stretch trying to rescue their reputation. The US imprisons accountants at firms like PwC, Ernst & Young, KPMG and Deloitte, for enabling tax dodging. Why not the UK?